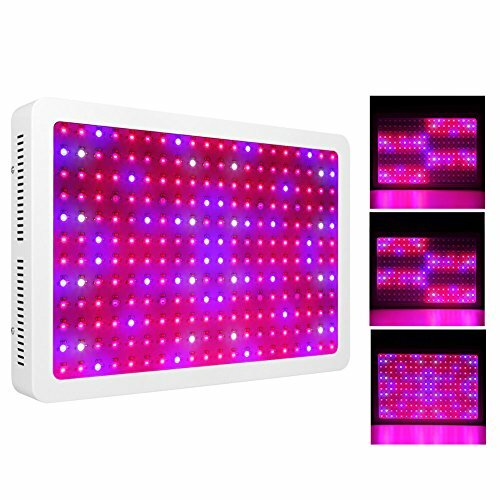 For this post we’ll be looking at our reviews of some of the best LED grow lights on the market today that will work perfect for your indoor hydroponic setup. Grow lights are an intrinsic part of indoor hydroponics setups as they provide the light needed by plants to grow without the natural radiance of the sun. You can have the best growth chambers, grow cups and the best in class water pump in your kit, but if you don’t have any light, your plants will not be able to carry out photosynthesis, which is one way of creating food for the plant. The Advanced Platinum Series P300 can produce two to three times the output of regular LED lights and is perfect for growing most crops in indoor hydroponic setups. The Advanced Platinum Series P300 produces the highest output for every watt of energy provided, giving you a bang for your buck and optimal conditions for your plants. The twelve-band spectrum was designed to provide all the light frequencies required by plants for photosynthesis. There are two modes to choose from: vegetable (VEG) and flower (FLOWER). Switch to either mode depending on what type of plant you want to cultivate. The newly designed aluminum casing, coupled with quiet fans ensure that the device does not overheat and can safely operate continuously, giving you the ease of mind you need when growing crops indoors. Grow lights need well-designed heat sinks to remove heat efficiently and continuously. As for energy efficiency, the LED light only uses 180 watts of power while delivering 400 watts worth of light and heat to your plants. This is due to the high-efficiency LEDs installed in the device. The Morsen 2400W LED Grow Light is a compact and stylish grow light that is shorter in stature than other brands but delivers much higher light output at a fraction of energy cost. Instead of individual 3-watt LED bulbs, the Morsen 2400W LED Grow Light is equipped with 10W dual LEDs. The power consumption is only a fraction of its actual output at 450 watts. Again, this is due to high efficiency, which is something that we always need in alternative systems like hydroponics, because we want to reduce our carbon footprint as much as possible. The Morsen 2400W LED Grow Light was designed to replace conventional grow lights like CFL and HID. Assembled with dual on and off switches at the back, you can easily control the brightness and intensity of the LED light so you will have more control of your setup. With the addition of a whopping six cooling fans, the heat removal in the system is much more efficient, which makes the light safer to use indoors. Less heat means reduced chances of a burnout. The GoGrow V3 Master Grower LED Grow Lights is a top of the line replacement for conventional HIDs as it is cost-efficient, power-efficient and has a good price point, too. 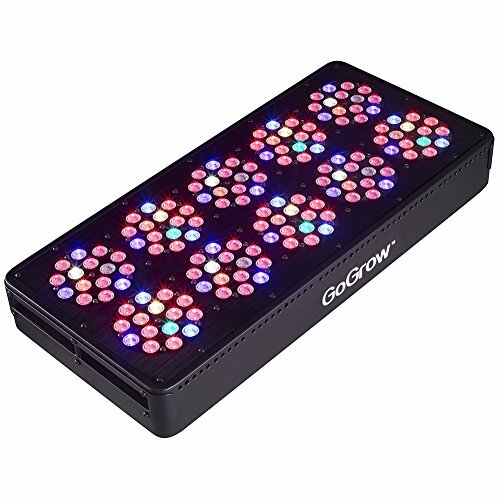 The GoGrow V3 Master Grower can generate 3000-6000K of light, and produces a unique spectrum that maximizes plant growth. The mixing of specific wavelengths was meant to increase the PAR for your crops. Made especially for growers who have their setups indoors, this grow light can be used for seedling state, growing stage and full maturity setups. The 12-spectrum design of the light can cover a 4 x 4 foot area easily (flower mode). If you switch the device to vegetative mode, the effective lit area is increased to 5 x 5 feet. This grow light consumes the lowest power so far in our lineup (320 watts) while effectively generating light that is 2-3 times higher than the actual power input. The beam angle is at ninety degrees and this device can be operated to -4 degrees Fahrenheit safely. Maximum operation time per day is 18 hours. 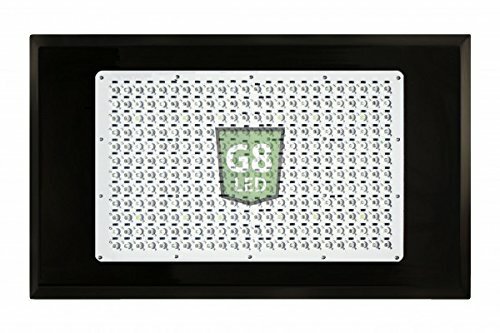 The Apollo Horticulture GL80X5LED is full-sized LED grow light that measures 13.2” x 13.2” x 3.75”. 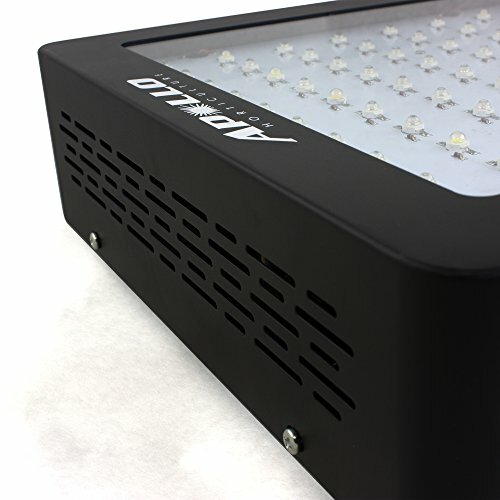 This grow light has been assembled with a total of eighty high-intensity LEDs, each operating at 5 watts. The average power consumption of grow light LEDs is between 3 watts to 10 watts, so the Apollo model falls somewhere in between, which is just right in our opinion. The manufacturer has rated the LEDs with a lifespan of 50,000 hours, which corresponds to more than two thousand days. Under ideal conditions, you will be able to use your Apollo Horticulture grow light for almost six years! The complete package includes one 400-watt LED panel, one power cord and stainless steel clips for installation. This particular model is ideal for all stages of plant growth but was specially designed for flowering and maintenance stage growth of plants. 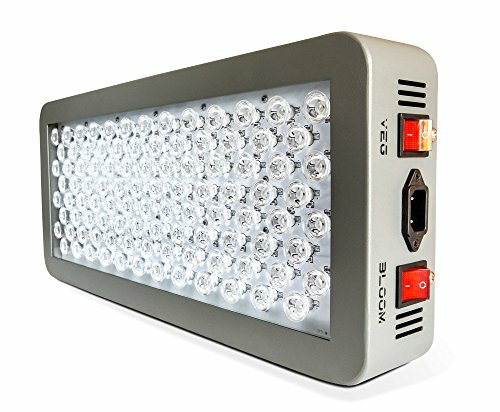 Use this lighting for grow tents and all kinds of hydroponics systems big and small. The total effective area can be adjusted by increasing or decreasing the height of the lighting. The Roleadro Galaxyhydro Series 300W Grow Light is yet another compact contender in the battle of high light output. The best thing about the Roleadro grow light is that it’s compact but still manages to generate sufficient heat for ideal growing conditions. Designed to help plants reach their maximum growth potential indoors, the Roleadro Galaxyhydro Series 300W Grow Light provides a very specific spectrum of light to plants. It focuses on the red spectrum, which is what plants really need and does away with extra light frequencies that are not very helpful for plant cultivation. From the perspective of system efficiency, this is good news since you won’t be paying for power that’s being used on the light that plants cannot use efficiently. The total rated output of this grow light is 400 watts, but in reality, it only consumes a total of 130 watts of AC power. A redesign from a previous model, the 300W Galaxyhydro model now dissipates heat 30% more efficiently than before. This heat stability will allow you to save up to 50% in power costs over time. The California Lightworks Solarstorm 440-watt grow light is made with a total of 88 pieces of high-intensity LEDs, each operating at five watts of power. The California Lightworks Solarstorm grow light takes a slightly different approach to producing UVB light, which plants need. Instead of depending on the LED array, the device casing houses two 15-watt UVB T8 tube lights that generate UVB continuously alongside the LEDs. Jewel-quality glass has been used for the primary optics to ensure pristine light emission. The effective lit area is 3 x 3 feet but can be adjusted by changing the height of the grow light. Integrated photon flux technology has also been added by the manufacturer for higher canopy penetration, which in turn creates better growing results. 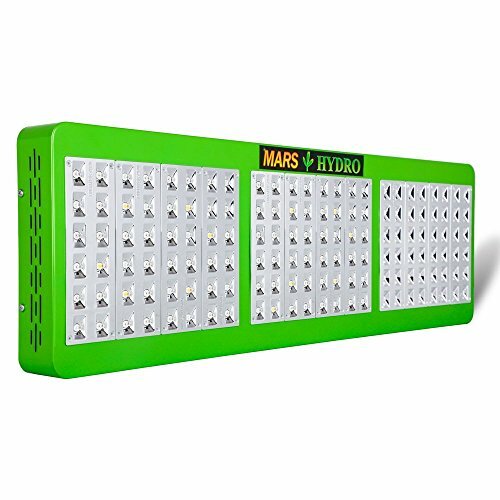 The MARS Hydro Reflector LED Grow Light is manufactured by MARS, a brand that has been around for seven years is known for high quality grow lights at excellent price points. The MARS Hydro Reflector LED Grow Light is made for high reflection of light, so it’s not dependent on the lining of the grow tent but instead delivers high-intensity light on its own using its own reflective material. It also has two modes (vegetative and flowering), making it perfect for small indoor setups that still require high output and light yields. This light measures 33” x 10.5” x 2.5” and can cover an area of 2.5 x 4.5 feet. If you switch to bloom/flower mode, the effective lit area is increased to 2.5 x 5.5 feet. This light can be used to replace a 350-watt HID light. This light consumes only 317 watts and operates at 110 volts. This award-winning grow light deviates from the usual twelve-band technology and instead focuses on a more optimal 8-band light frequency range with the addition of IR and UVB. Unlike other brands, this particular LED grow light can withstand 24 hours of nonstop use! In terms of coverage, this model has the highest effective area at 24 square feet. 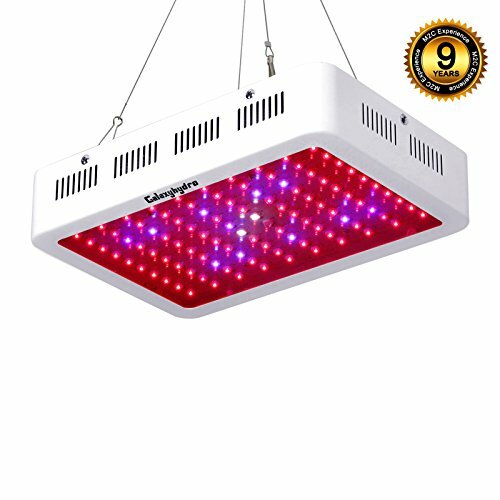 Obviously, this grow light is ideal for larger hydroponics setups with multiple growth chambers and more than a few dozen active grow pots. The total light intensity is rated at an intense 900 watts, which is definitely enough for healthy flowering and growth of different plant types! As for voltage, the manufacturer has added an autopilot feature to main IC of the grow light, making it possible to operate it at either 100 volts or 240 volts. 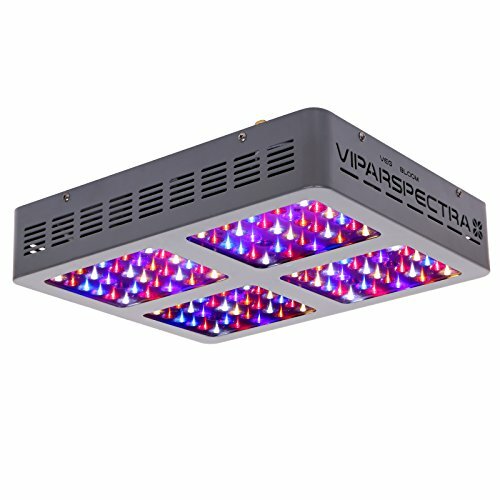 The VIVARSPECTRA Reflector Series 600W Grow Light is specifically engineered to create a perfect, balanced light output and coverage for optimal plant growth and high energy efficiency. The biggest thing about the VIVARSPECTRA grow light is its light band, which has been specifically set to give plants what they need – the correct combination of light frequencies at different stages of growth (from seedling to full maturity). Think of having natural sunlight at home. This is the kind of light output that VIVARSPECTRA provides. The total rated output of VIVARSPECTRA is 600 watts, but its actual power usage is only 269 watts (less than half of out light output). Its effective coverage is 3 x 3 feet. Effective area lit can be reduced by lowering the light closer to the plants. Also comes with a highly efficient cooling system and that is super quiet, coupled with an aluminum casing that dissipates heat more quickly than plastic or other materials. Looking for a specific wattage? Here is one of my articles covering nothing but the top 1000 watt grow lights. Historically, grow lights are used when there is insufficient light in an area where crops are being grown or if crops are being grown indoors. During the winter months, the importance of supplemental electric lights becomes more apparent as sunlight dwindles and hydroponics setups are either shut down or transferred indoors if the grower wishes to continue year-round cultivation. The use of artificial light to allow the growth of plants is not new. In fact, in 1868, Andrei Famintsyn used the latter in his research on plants. Famintsyn is a botanist. Now, the biggest challenge for hydroponics growers is how light generally disperses. Normally, surfaces exposed to light only receive a quarter of it. This poses a palpable hurdle to indoor setups as plants will only receive ¼ of the actual output of the available grow lights. Either you go up (in wattage) to increase the intensity of the available light for plants or you put reflective material around the encasement of the growth chambers to reflect light to the grow pots. Fortunately, this problem has been solved in recent years by manufacturers of grow tents and grow boxes. What they did was they added an extra layer of Mylar film to the interior of grow boxes and grow tents. As a result, at least 95% of the light being emitted by available grow lights is reflected to the center of the space, where the plants happen to be. Not all plants require blazing hot sunlight all day long. Some plants grow well in shade or prefer shade in the first place. This means you need to do your research first before buying grow lights to ensure that you’re getting the right type of grow light for your plants. Too little and your plants will become stunted. Too much light can be harmful, too. Yes, there is such a thing as too much artificial light, especially if the intense light is focused on the plants. Of course, your artificial lights are going to consume electricity. This is something you have to think about very carefully as high-wattage lights can really bring up your power bills. Contrast your expected harvest with your costs and you will be able to decide intelligently. How much space do you have in your grow tent? Where would you install the new lighting? What type of vertical/horizontal supports would you use to install the new lighting? How about the power, where would the lines be coming from? When it comes to installing new lighting devices, you’re also working on the overall engineering of the hydroponics setup as the lighting is an integral part of it. Now that you know the basics of grow lights, you can get an idea of what to look for when choosing a good grow light. If you’re still not certain then hopefully our list of the best LED grow lights this year will provide a winner for you.